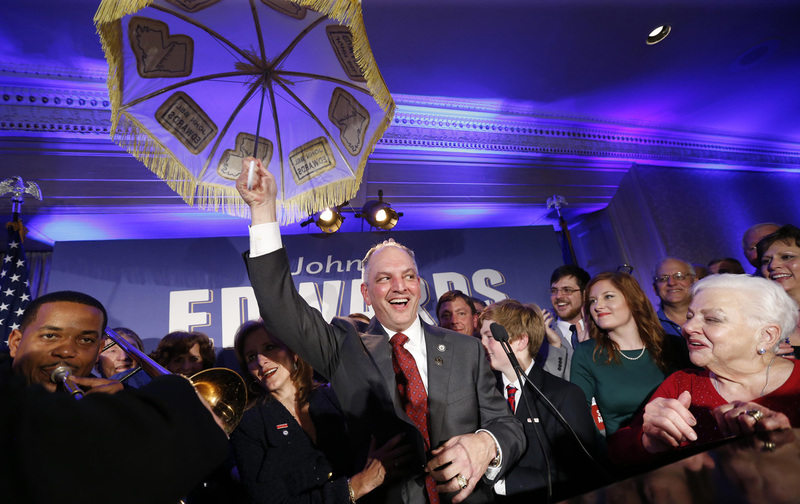 John Bel Edwards’s surprise victory in Louisiana offers a lesson to Democrats: Campaign fiercely, mobilize urgently. The last time Louisiana backed a Democrat for president was not in some Democratic landslide year like 1964 or 1936; nor even in some particularly good Democratic year in the South like 1976. It was in 1996, when Bill Clinton won the state with an outright majority of 52 percent to just 39 percent for Republican Bob Dole. Even in 2012, when Democrats were writing off the Deep South, the 2012 Obama-Biden ticket secured more than 40 percent of the vote statewide, carried ten counties and finished with more than 45 percent in a half dozen others. The Obama-Biden ticket actually ran better in Louisiana in 2012 than it did in 2008—despite the fact that Republicans ran better nationally in 2012 than in 2008. So there are distinct dynamics in play in Louisiana, a state with a rich history of economic populism and wild politics. But, then, most Southern and Western states that are now seen so rigidly Republican and consistently conservative have richer and wilder political histories than the practitioners of today’s diminished politics would have us believe. That is something to keep in mind when considering the upset victory of Democrat John Bel Edwards in Saturday’s gubernatorial election. Yes, Edwards was running against Republican US Senator David Vitter, one of the most pathetic characters in American politics. But it is important to remember that Vitter has been pathetic for a long time, and that hasn’t stopped him from winning statewide elections. Nor has it stopped other irresponsible and extreme Republicans in Southern “red states” that are imagined to be so rigid in their politics that Democrats can never compete. So how did Edwards beat Vitter this time? How did a Southern Democrat “confound the conventional wisdom that this victory couldn’t happen” and secure a 56-44 win? And what does it tell us about how Democrats might play politics in a region where just weeks ago—after devastating defeats in contests for the governorship of Kentucky and control of the Virginia State Senate—Democrats were being dismissed as unelectable? It is true that Democrats have lost a lot of ground since the Civil Rights Act of 1964 and the Voting Rights Act of 1965 were adopted, and since the first wave of “New South” Southern Democrats left the scene. It is true that the party lost just about every presidential, US Senate, and gubernatorial race of consequence in the Deep South in recent years. But it is also true that Democrats can still win in the region, as the Louisiana result confirms. It has something to do with embracing hope, and the politics of inclusion, as Edwards explained in his victory speech Saturday night. That referencing of the diversity of Louisiana, and of the diverse coalition he built, offers an important insight into what worked for Edwards. The Democrat excited and mobilized Democrats in a state where his party has been beaten down, but where its partisans were still ready to fight. John Bel Edwards entered the 2015 race as a fighter. The minority leader in the Louisiana House, he led the opposition to outgoing Governor Bobby Jindal’s austerity cuts to education and healthcare programs. As a candidate for governor, he made a big deal about the fact that his mother was “a charity hospital nurse who taught all of her children compassion for other human beings” and that his wife was a public-school teacher. As soon as he made it into the runoff with Vitter, Edwards began airing television ads that contrasted the Democrat’s record of military service (as a West Point graduate and Army veteran) with Vitter’s record of scandals involving prostitutes. “It’s a tough ad. It’s one of the tougher I’ve ever seen,” Jennifer Duffy, an analyst for the Cook Political Report, told the New Orleans Times-Picayune. Unlike in Kentucky, where the Democratic gubernatorial candidate ran as a cautious manager, Edwards fought a fierce campaign. And he fought for the right things. While debates about whether to expand access to Medicaid have become a complex part of the politics of southern and border states (such as Louisiana and Kentucky) since the enactment of the Affordable Care Act, Edwards did not get lost in the bureaucratic weeds. He pledged to expand Medicaid with an executive order issued on his first day in office. That stance inspired a Republican-run “Super PAC” and the Vitter campaign to attack Edwards as an “Obama Democrat” and an “Obama liberal.” Edwards is no liberal—he’s a social conservative, who takes anti-abortion and anti–gun control stances that would put him outside the Democratic mainstream in much of the country. And Edwards sought endorsements from Republicans who had had it with Vitter—a cartoonish character who sought to save his campaign by running ads that featured him in hunting gear with a Duck Dynasty star and with fear-mongering about Syrian refugees. But pundits who portray him as a Republican-lite contender miss the point of the candidate and the campaign. Edwards needed to be a Democrat to pull his win off. The party tie helped him reconstruct a coalition of the sort that, for decades, elected Democrats like Edwin Edwards (no relation) who combined good-old-boy style with economic populism. With backing from the Louisiana AFL-CIO and the Louisiana Association of Educators and the Louisiana Federation of Teachers—both of which celebrated his opposition to Jindal’s voucher schemes—Edwards campaigned as a champion of public education. “Never has there been a simpler decision for us,” Louisiana Federation of Teachers president Steve Monaghan said of the union’s endorsement of the Democrat. That earned Edwards even more attacks from the Republicans, including a phony “John Bel Edwards for a Liberal Louisiana” website that featured items headlined: “Big Labor Union Bosses Love Obama Liberal John Bel Edwards” and “If You Like Barack Obama, You’ll Love John Bel Edwards.” For Republican operatives who cannot imagine that anyone likes Obama, those lines might have made sense. Indeed, they poured a fortune into delivering the “John Bel Edwards-Obama” message on TV, radio, and the web. But the Edwards campaign and its labor allies poured energy into mobilizing union members and African-American voters who do indeed like Obama. Early voting spiked in traditionally Democratic regions of the state—rising by 50 percent from the multi-candidate October primary (in which Edwards and Vitter beat seven other candidates) to Saturday’s runoff (in which Edwards and Vitter faced one another). Overall turnout was up from the primary to the general election, and up substantially from 2011, when Jindal was easily elected. What was especially important was where the turnout increased. For instance, in Orleans Parish (New Orleans), turnout was 32 percent for the primary and Edwards won 55,984 votes. For the general election, turnout was almost 39 percent and Edwards received 81,900 votes. The predominantly African-American electorate—which had supported Obama overwhelmingly in 2008 and 2012, and which had no problem with the designation of Edwards as an “Obama Democrat”—gave this year’s Democratic nominee for governor 87 percent support on a heightened turnout. That did not happen by chance. A week before the election, Louisiana’s Advocate newspaper reported that Edwards spent the weekend before the election “pumping up enthusiasm among African-Americans, who form the base of the Democratic Party. He visited five African-American church services in New Orleans last Sunday morning and got standing ovations after speaking to congregants at each one.” Edwards was back in New Orleans on Election Day, campaigning with African-American and Latino elected officials, community leaders and union members. There are some basics to politics. And nothing is more basic than turnout. Turnout patterns matter. When turnout is up, that generally helps Democrats. And when turnout is up in traditionally Democratic areas, that helps even more. But to get turnout up in those areas, Democrats must first excite voters and then pour energy into mobilizing them and getting them to the polls. That’s the lesson of this month’s gubernatorial races in Kentucky and Louisiana. In each case, there was a capable Democratic nominee and a controversial Republican nominee. Yet, in Louisiana, the Democrat fought very hard and mobilized voters very aggressively—with a boost from organized labor and African-American groups. And the fighting and the aggressiveness paid off. Turnout in Kentucky, where Democrats lost the governorship in early November, was just under 31 percent. Turnout in Louisiana, where Democrats won the governorship in late November, was almost 40 percent. Democrats will wrestle with the question of how much energy to put into the South in 2016. There will be plenty of strategists who suggest that the smarter move is to look elsewhere, and that winning is impossible in the region. And those arguments will carry a good deal of weight in an age of big-money politics with exceptionally high stakes. But if strategists are looking for signals from 2015 about prospects for renewing the “50-state strategy” that served the party so well in 2006 and 2008, they can begin in the Louisiana of John Bel Edwards and the “hope over scorn” coalition that was mobilized by a fierce campaign against not just David Vitter but the austerity politics of Bobby Jindal and the Republicans who would have us believe the lie that that voters anywhere are comfortable with an austerity politics that cuts education and healthcare.